1. This machine adopts advanced PLC automatic control system that conquers error of old machine caused by multi electric apparatus; open system adopts OMRON pneumatic element that guarantees stability of process and enhances quality. 2. 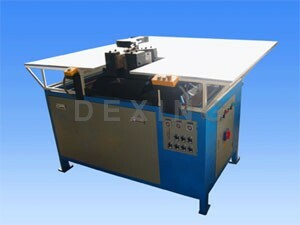 It breaches many processes of old welder such as manual work for pruning rest material and welding lump and so forth. 3. This welder is double hole full automatic welding equipment; after welding, it cleans rest material automatically; therefore, it guarantee even, firm and beauty of welding angle; the production efficiency is twice of old welder. 4. Mould and frock has up and down layer with adopting precise beeline rail transmission breath that guarantees precision of equipment; the welding way is: automatic heating (firing type) ~ vacuum adsorption ~ welding ~ inner cooling ~ outer cooling ~ automatic outlet. 5. Security protection system: in order to protect pressing, it equips photo electricity protector before mould with adopting two-hand open button; it adopts HZ12-25 switch; it can open electric case after power failure. 6. Leg period of this welding machine is 11~14 second/double angle; the output can reach 600~650 sets; the stress of welding angle is higher than criterion in same industry. 7. Heat Capacity Required about 400°C.